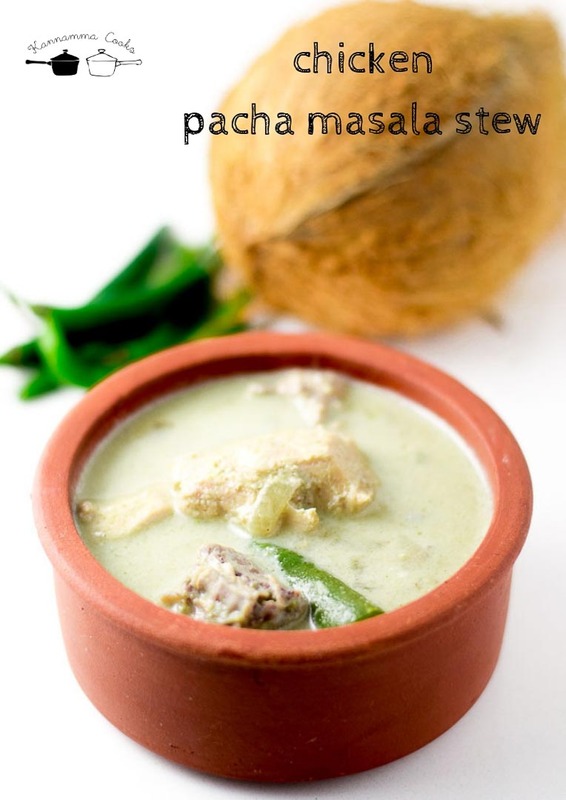 Chicken Pacha masala stew made with a simple masala paste made with green chillies and stewed in coconut milk. Perfect for Dosa, Appam and Idiyappam. This recipe is from the repertoire of Vinodh’s sister Padma akka. 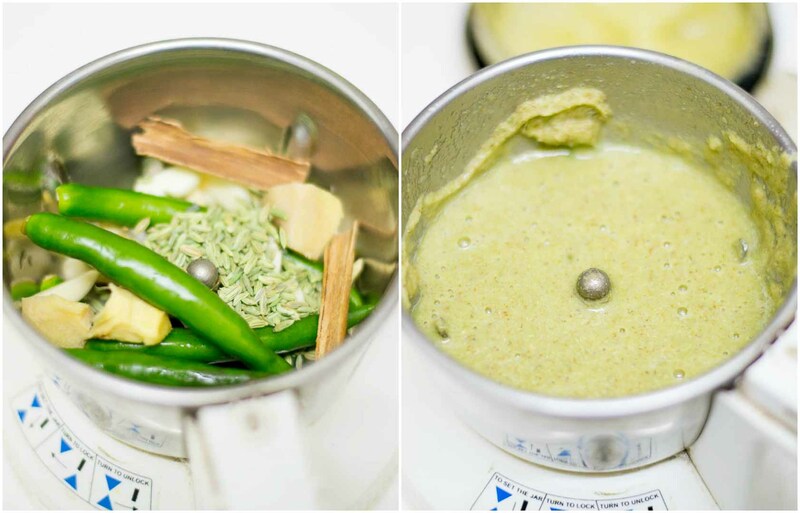 I would say that this is the Indianised version of Thai green curry. The flavour of coconut milk along with fennel seeds is divine. 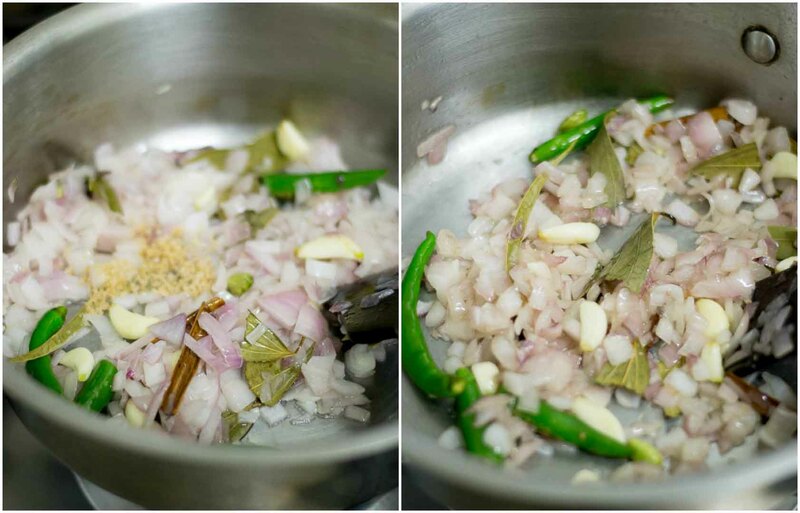 Padma akka learnt this recipe from Cook Subramani whom they fondly called as “Suburu” who is no more. This recipe is perfect for parties and is perfect for a wintry night. It goes really well with dosa, appam or idiyappam. Take a mixie jar and add in the green chillies, garlic, ginger, fennel seeds, poppy seeds and cinnamon. Grind to a smooth paste adding half a cup of water. Let the paste be very fine. Set aside. 1. If you cannot source poppy seeds, just omit it. 2. Use green chillies according to your like. Use less or more depending on how spicy you want the stew. Next, lets cook the chicken. I like to use chicken in bone for this recipe. The gelatinous juices from the bones that release while cooking are very flavourful. 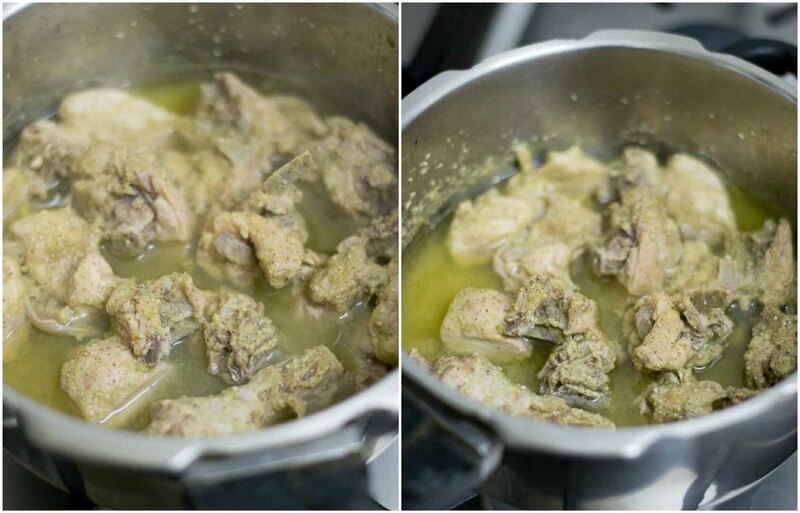 When making any south Indian curry, make sure to use chicken in bone. 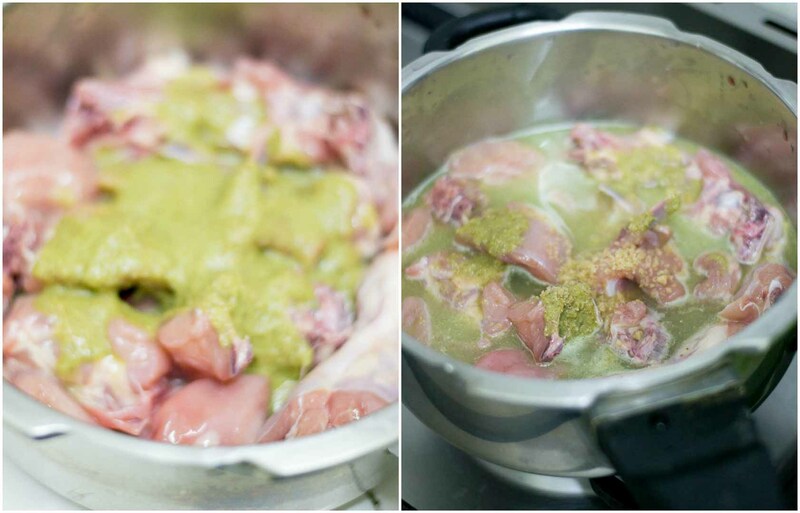 Take a pressure cooker and add in the chicken, half of the ground masala paste and half a teaspoon of salt. Add in a cup of water to the cooker. Cook for 3-4 whistles and remove from heat. Let the pressure from the cooker settle naturally. Set aside. 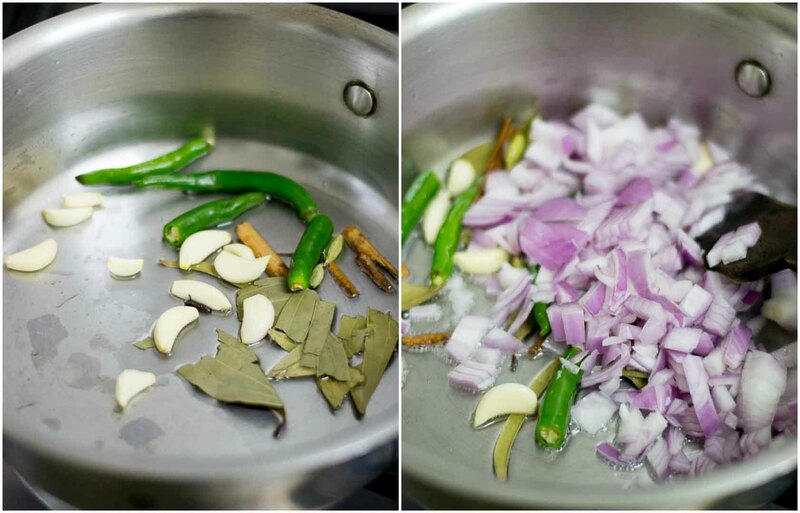 Heat oil in a pan (coconut oil) and add in the cinnamon, clove, cardamom, bay leaves, green chillies and garlic. Add in the chopped onions. Saute the onions for a few minutes until soft. Add in the remaining masala paste and the salt. Saute for five minutes. Add in the cooked chicken along with the juices. Add in the second pressed coconut milk. Let the curry simmer for 15 minutes on a low flame. Here is the recipe for making coconut milk at home. Add in the first pressed coconut milk. Simmer for just a minute. 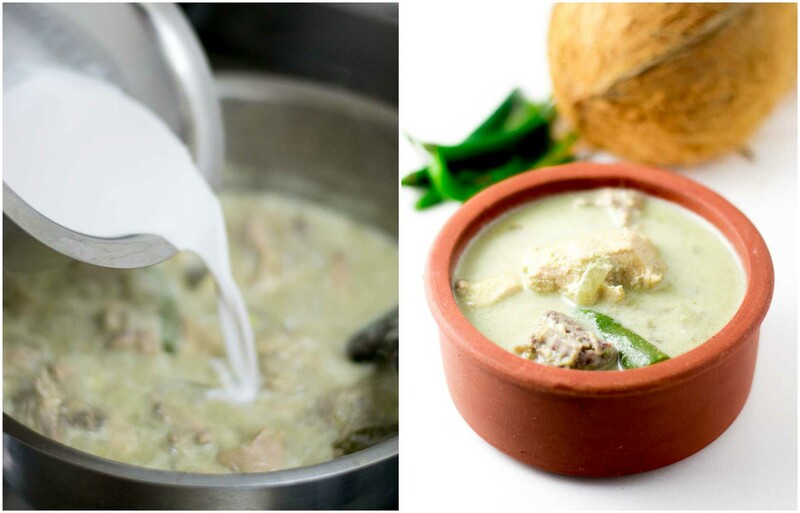 Do not let the curry simmer for a long time after adding the first pressed coconut milk. Chicken pacha masala stew is ready. 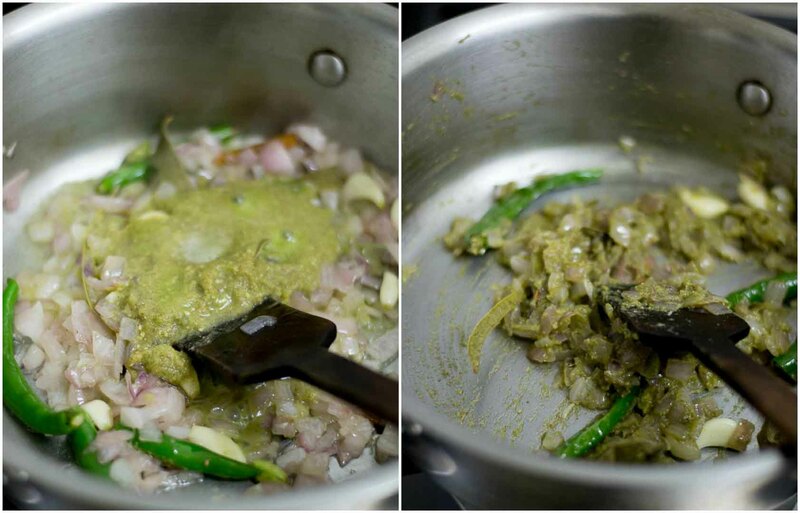 Take a pressure cooker and add in the chicken, half of the ground masala paste and half a teaspoon of salt. Add in a cup of water to the cooker. Cook for 3-4 whistles and remove from heat. Let the pressure from the cooker settle naturally. Set aside. 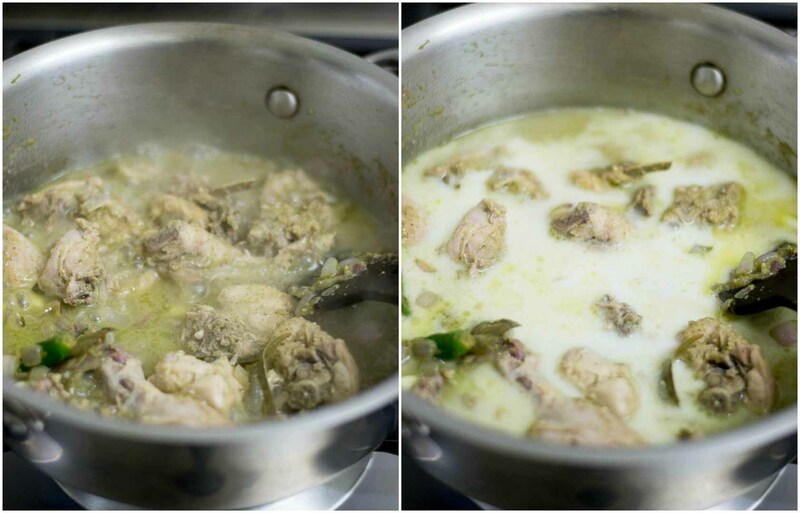 Add in the cooked chicken along with the juices and add in the second pressed coconut milk. This was very simple recipe yet flavorful and very soothing on rainy/cold day. Kudos to Suguna. I did not make coconut milk from fresh coconut but used canned lighter version of the milk. 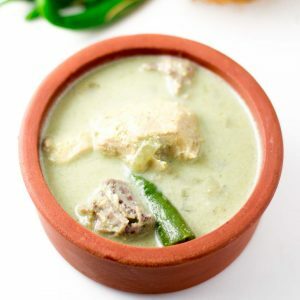 Dear Suguna aka Kannamma, I chanced upon your site when researching Chettinad recipes, and came across your lovely recipe collection such as the chicken pacha masala stew above. I cannot wait to try it out. I am half-Indian (Parsi) and my family lives in Bombay, but South Indian cuisine is by far my favorite thing, and anything with coconut, curry leaves, green chillies and mustard seeds (and then some) gets my nostrils flaring in anticipation! (I have meanwhile discovered your curry leaf chutney and am so excited to try that!). All the best in all that you do and thank you for sharing your passion with avid home cooks like myself. Haven’t tried this but sounds and looks delicious.